Tai Chi Chuan is a kind of moving meditation with ancient roots in Chinese martial arts. In this program, Dr. Yang, Jwing-Ming teaches you the complete traditional Yang-style long form step-by-step, while explaining the meaning of each movement. Yang Tai Chi is the most popular style in the world, and it is practiced by millions of people every day. By practicing Tai Chi, you relax the mind and body deeply, which is the key to maintaining and improving your health. When you are calm and centered, your body's natural restorative abilities are most efficient. Regular practice can benefit your strength, flexibility, bone-density, and muscle mass. Taijiquan (Tai Chi Chuan) is a slow and relaxed moving meditation. It is also a sophisticated martial arts system. Through practicing Taijiquan, you are able to calm down the mind, locate your spiritual center, and consequently find your entire being. From the relaxed moving exercise, you can bring your physical body into an ultimate level of relaxation and natural ease, resulting in smooth Qi (inner energy) and blood circulation. This is a key to maintaining health and recovering from sickness. This REVISED EDITION has a new easy-to-follow layout, each movement presented in a series of large photographs with clear same-page instructions for each Taiji posture. This book is sure to advance your practice and save you much time and energy. Front and rear view to follow along easily. A 1-on-1 class with a real Master. Bestselling Tai Chi DVD with amazing detail. Tai Chi Chuan is a kind of moving meditation with ancient roots in Chinese martial arts. In this program, Dr. Yang, Jwing-Ming teaches you the complete traditional Yang-style long form step-by-step, while explaining the meaning of each movement. Yang Tai Chi is the most popular style in the world, and it is practiced by millions of people every day. By practicing Tai Chi, you relax the mind and body deeply, which is the key to maintaining and improving your health. When you are calm and centered, your body's natural restorative abilities are most efficient. Regular practice can benefit your strength, flexibility, bone-density, and muscle mass. The low-impact exercise has been shown to improve symptoms of depression and insomnia, and promote the healing of chronic conditions. Tai Chi is an excellent way to relieve stress, lower your blood pressure, and develop a positive attitude toward life. Tai Chi will increase your circulation of blood, nutrients, and energy throughout the body, resulting in improved vitality and longevity. 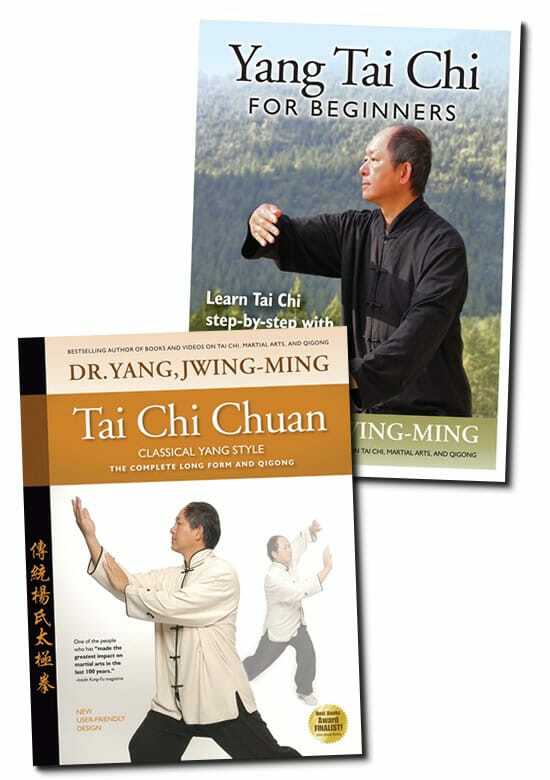 Master Yang instructs the complete Tai Chi form from the front, and shows each movement one-by-one from multiple angles. There is also a rear view of the form that you can simply follow-along with once you're familiar with the movements. Tai Chi will develop your mind's alertness, awareness, and concentration. Most importantly, as you practice, pay attention to the feeling within the movements, so you may appreciate the profound essence of Tai Chi Chuan. Dr. Yang's tai chi lineage can be traced back to the Yang family through Grandmaster Kao, Tao (高濤) and his teacher Yue, Huanzhi (樂奐之), an indoor disciple of Yang, Chengfu (楊澄甫). "The Harvard Medical School Guide to Tai Chi" says: "regular practice leads to more vigor and flexibility, better balance and mobility, and a sense of well-being. Cutting-edge research from Harvard Medical School also supports the long-standing claims that Tai Chi also has a beneficial impact on the health of the heart, bones, nerves and muscles, immune system, and the mind."